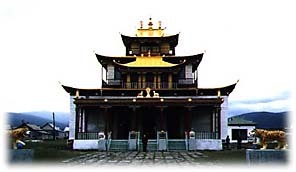 In the early 17th century, Tibetan Buddhism spread north from Mongolia to Buryat communities of the Baikal region. The second wave came directly from Tibet. Aiming for weakening the influence of Mongols and Manchurs in the region, the tsar conferred the title of Bandido Khambo Lama on the priors of Gusinoozersk Datsan to acknowledge them as leaders of Buryat Buddhism. Thus, Buryat tradition became officially independent of the Mongolian Church. In 1741, Empress Elizabeth issued a decree that recognized the Lamaistic belief in Buryatia and authorized establishing of 11 monasteries (datsans) with 150 lamas on the staff. This is considered the date of the official recognition of Buddhism in Russia. By 1846, 34 datsans had been built in Buryatia. With much effort and a lot of expenses, Buryats managed to import a vast number of the sacred books from Tibet, China, and Mongolia, and adopted many living practices of both the dominant Gelug and other schools. 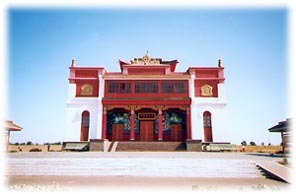 During 1917-1937, 79 temples (khuruls) were closed down in Kalmykia. Shortly after the revolution of 1917, Chore theological academy was eliminated, the other one lasted until 1933. None of the novitiates remained in khuruls in 1937 as result of so-called ‘systematic struggling for the young generation’. 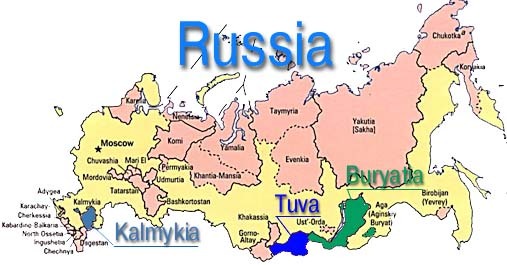 Since Kalmyk autonomy was abolished in 1943, and the people were deported to Siberia, the existence of temples and Buddhism in Kalmykia was out of the question. In Kalmykia 22 temples now. In Tuve about 16. In Buryatia more than 30 temples. Many buddhist center openly in all big city, including Moscow and Saint-Ptereburg. Whole buddhists in Russia about 2000.000.